Wow this is impressive. This movie came out in 1998. In my opinion it really kick started the Hobby. In 1998 Andy Release DD01 and DD02 which at the time were the coolest thing to hit the market. It was my first as Hobby Bunker, I was 22 years old. 20 years later these are release. So it is my 20th anniversary I guess and 20 years of WWII sets by K&C (of course MG and wooden tanks before). Here is to 20 years! I just pre-ordered a bunch of these so I don’t disappoint anyone. I guess we can assume the next 4 are coming in November? “SAVING PRIVATE RYAN” is a very special war drama film for many of us history movie buffs and especially so for myself and K&C. Back in 1997, through a Hollywood friend and fellow collector, I heard about a big new D.Day movie that was already being filmed in Britain and Ireland by none other than Steven Spielberg. At the time all we knew was that it featured American paratroopers and U.S. Rangers and was centered around Normandy and Omaha Beach. 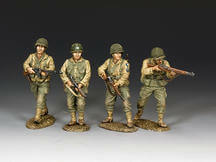 And so, K&C produced some of its very first American D.Day soldiers which began our entire D.Day range which continues to this day. Journey forward quite a few years to when we met Capt. Dale Dye U.S.M.C. ret’d., the military advisor on ‘Ryan’ and countless other great war movies and discussions about doing a special ‘tribute’ to a fantastic movie and the real ‘heroes of D.DAY’. 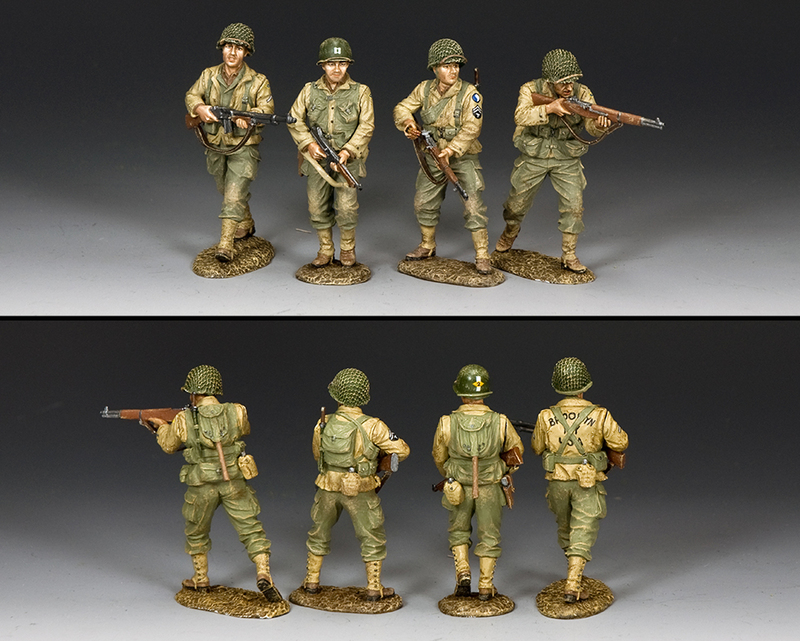 This 4-figure set (the first of 2) features the perilous journey through the fields and bocage of German-occupied Normandy to try and find PFC James Ryan, 101st Airborne. Capt. John Millar, 2nd Rangers takes the lead carrying his Thompson sub machine gun. Backing him up is PFC Reiben with the BAR ( Browning Automatic Rifle). Next to him is Cpl. Upham, not a Ranger but an interpreter borrowed from another unit. The final member of this first 4-man squad is Pvt. Jackson, a left-handed sniper holding his bolt action M1903 Springfield with telescopic sight. Don’t miss out on a terrific movie and … 2 x outstanding sets of D.Day soldiers!